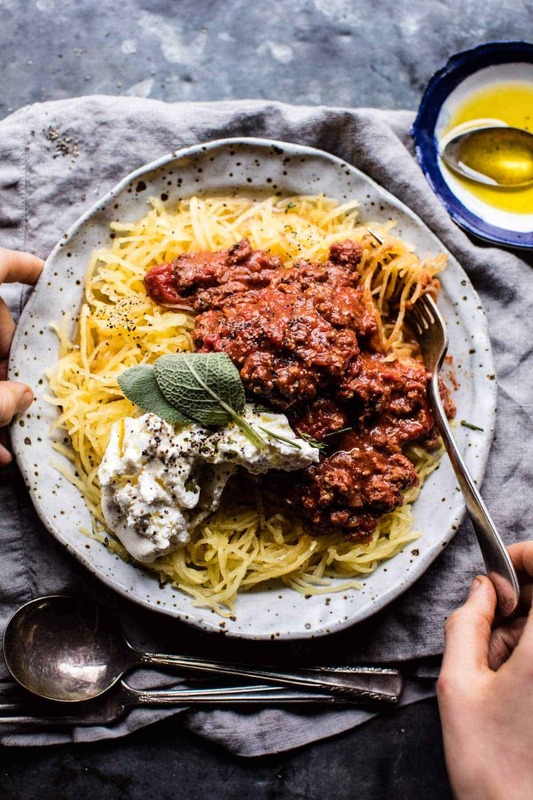 Crockpot Spaghetti Squash Lasagna Bolognese + Video. I know that most of us have work today, but I’m hoping it’s going to be more of a “fun” kind of work day! I was talking with one of my colleagues on Friday who told me that everyone in their office is wearing their costumes to work. Her office hosts a “best costume” contest every year. Um, ok! How fun is that?! What a cool office environment! Anyone else work where they do fun things like that? So how about Halloween parties, any fun festivities over the weekend? If you dressed up, what were you, or what are you going to be?? Tag me on Instagram or snapchat me with all your creepy pics! My oldest brother Creighton was planning on being a banana, but with the World Series going on in Cleveland, Halloween has pretty much been all but forgotten there. Everything has been Go Tribe, even Progressive Field was sold out for games 4 and 5…and that was just to watch the games on the jumbotron! Let’s hope the Indians can get it done tomorrow night IN Cleveland! My weekend included all things FALL. Meaning I spent time hiking, carving pumpkins with the little sis, doing some kitchen “work”, because well, it’s just what I do. I also made hot chocolate and watched a kind of scary movie. Ok fine, it was really just a Harry Potter marathon with Asher. Loved it! SO in other news, tomorrow is NOVEMBER and that has me freaking out just a lil bit. To be honest, it hasn’t hit me that October is over. It just flew by, like flew. I need to start planning Thanksgiving and like stocking up on my Lululemons and cozy Burton socks (courtesy of the lil bro of course) and prepping for the holidays and that thing called old man winter! Ahh…so not ready. It’s weird because normally by this time of year the temps here are pretty cold, but the last couple weeks have been so mellow weather wise. No snow and pretty warm and sunny days. Definitely outta the ordinary for my little mountain town, but trust me – I know it’s coming soon! Anyway, let’s talk spaghetti squash and crockpot things! 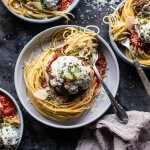 First things first, I have to say that I am really excited about this recipe because it makes cooking and working with spaghetti squash SO much easier. 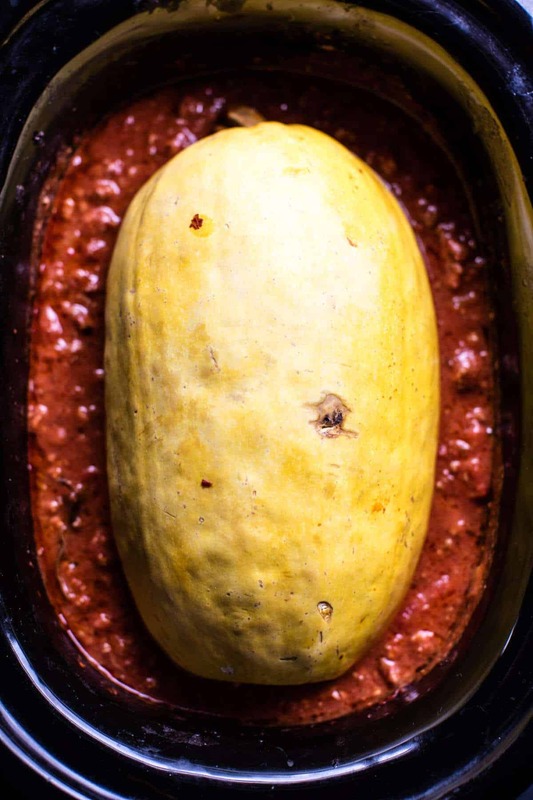 It might seem weird, but you actually cook the spaghetti squash right in the crockpot with the Bolognese sauce. Yes, in the crockpot and IN the sauce. For me, this is so exciting because my typical way of preparing spaghetti squash is to cut it in half, seed it and then roast it for forty-five minutes to an hour. It’s still pretty simple, but also kind of a process. Cutting spaghetti squash is not the easiest task and I swear one of these days the squash is going to win…yikes. Anyone feel the same? 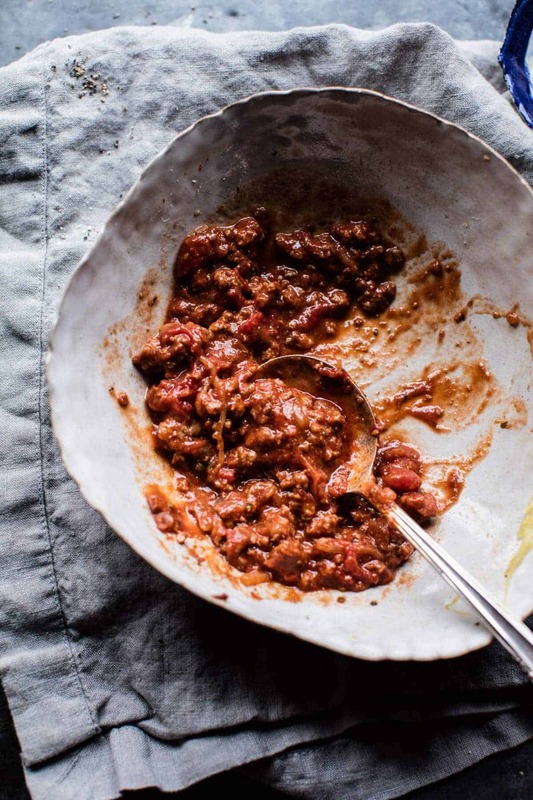 When I was thinking about recipes the other week, the idea of a lasagna style Bolognese served over spaghetti sounded really good, but I wondered if there was maybe an easier, faster way to get everything cooked. I’ve seen some spaghetti squash crockpot recipes before, so I figured I would give it a try. Guys. This recipe is kind of life changing. You literally just add everything to the crockpot, slow cook all day, and come home to an amazing dinner – DONE. No boiling water, no turning on the oven, none of that. Just slice open the squash (which will be soft and the easiest thing to cut through), remove the seeds and scrape the squash out into a bowl. Then top with sauce and burrata (parmesan too if desired) and EAT. It literally does not get easier! And also…the crockpot cooks the spaghetti squash perfectly. I let mine slow cook for about six hours and it was perfect. Not mushy (which I was worried it would be) but tender and buttery and soo good! Especially when topped with lasagna inspired Bolognese. Yuummmms. This crockpot meal will make weeknight dinners easy! Heat a large skillet over medium high heat. Add the sausage, ground beef, and onion. Season with salt and pepper. Cook, breaking up the meat with a wooden spoon, until the meat is browned all over and the onion soft, about 5-8 minutes. Remove the skillet from the heat and transfer the meat to your crockpot. Add the garlic, tomatoes, tomato paste, oregano, bay leaves, and milk. Stir to combine. Add the spaghetti squash to the center. Cover and cook on low for 6-8 hours. Carefully remove the squash from the crockpot and transfer to a cutting board. Wipe away any grease and then carefully cut the squash in half lengthwise. Remove the seeds, then using a fork, scrape the squash into strands. If the sauce is soupy, crank the heat up to high and let it cook for 30 minutes or until thickened. If the sauce is thick add 1/4 cup to 1/2 cup water. 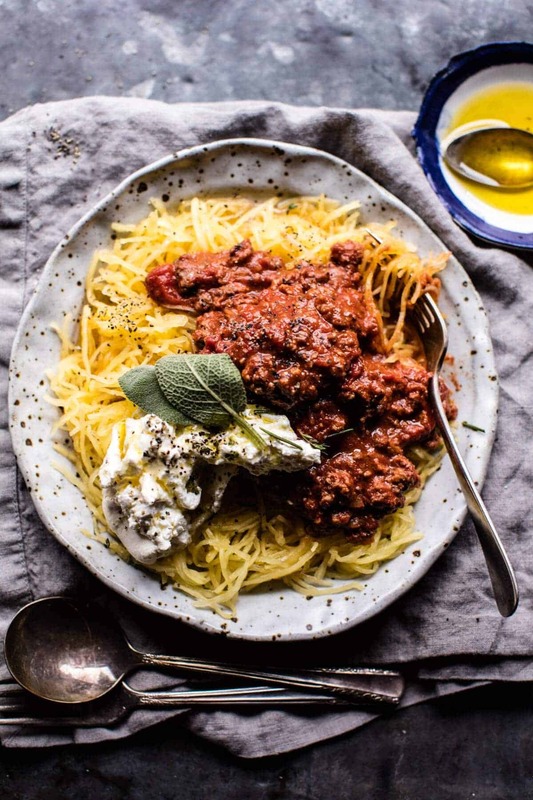 To serve, divide the spaghetti squash among bowls and ladle the bolognese over top. Add the cheese and sprinkle of basil or parsley. Enjoy! Hope everyone has a great Halloween! See you in November! ?? Thanks so much Rhian!! Hope you had an amazing Halloween! Yes, Happy Halloween! I am so loving this recipes today, yum! 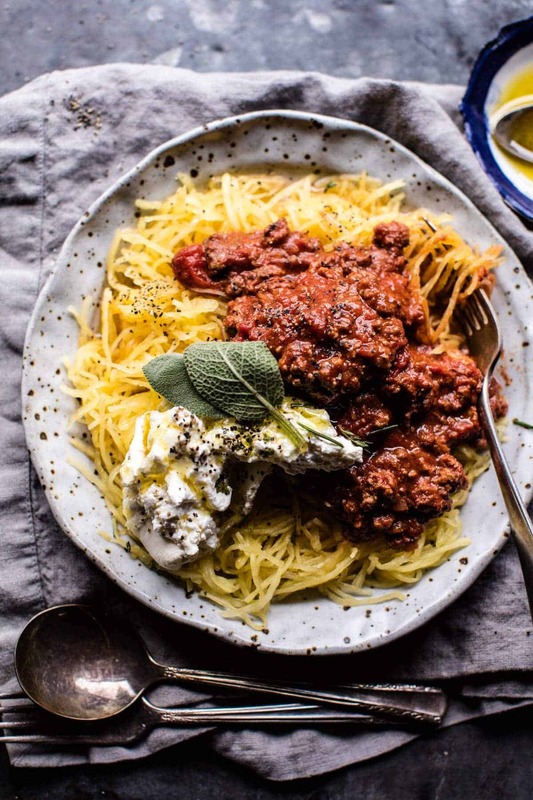 I love spaghetti squash and I’ve never tried anything like this! YAY!! Thanks Tori!! Hope you love it!! Haha! Hope you got to make this!! Spaghetti squash is perhaps one of my favorite squashes ever! this looks wonderful! Ah, same!! Hope you love it! Ingenious! Will have to try this soon. Hope you love it Rose! I love the whole concept of the recipe, but I must ask… Where did you get that magnificent speckled dish? Thank you!! I bought those from a shop in London and have been searching and searching for the email, but I can’t find it. Still looking!! So sorry. I will email you if I find it. You so read my mind with this recipe! I was hiking with my husband this weekend and was saying how I want to make a dish exactly like this! Thank you! Can’t wait to try it! Ah YES! Hope you love it! Thank you! love the idea of just cooking the squash whole! cutting it in half is a bit scary, especially with a bad knife or a big squash. and i feel like any other way it would take days, but it’s already thrown in the slow cooker and meant to be cooked for a while. Yeah it can be! Slow cooker can be the best way sometimes! What if you don’t want chunky tomatoes? I like spaghetti sauce but HATE chunky tomatoes. More tomato paste? Looks delicious! 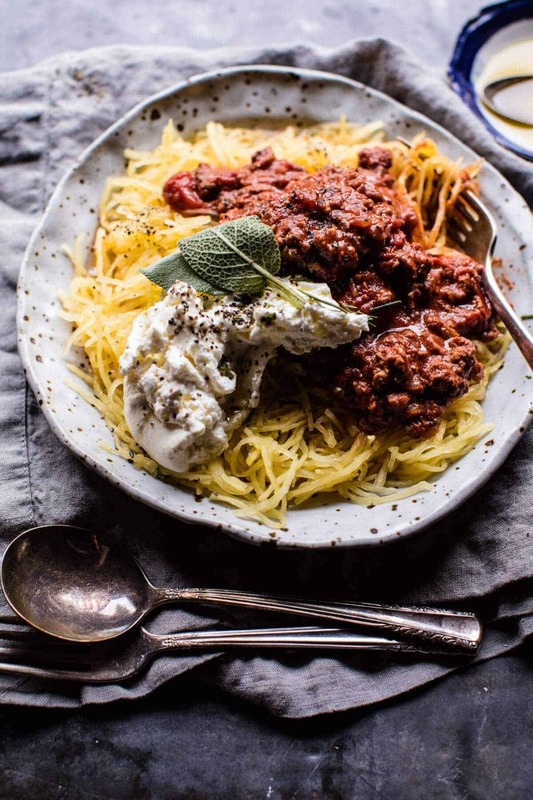 I love spaghetti squash dishes and this looks just scrumptious and so hearty! We did a Halloween potluck at my office last week and some people even dressed up. It’s a fun idea, I guess. I opted to sit out since I had a nasty cold all week and didn’t bring anything or want to infect people with my germs. It was bad enough I had to show up at work haha. Anyway, this is right up my alley and looks so cozy. !I have another trick for any other recipe that wants spaghetti squash. You don’t have to cut the squash, either! Just poke a bunch of holes around the squash, say 6 or 8, at regular intervals, being sure they go through to the center. These are the air holes that let out steam and prevent it from exploding. It would be kind of exciting to see it explode, I’m sure, but the clean-up…not so much. Stick the whole squash in the microwave. Give it 10 minutes on high; turn it over and give it another 10. Depending on size, it might be done, i.e.. a little soft when you press the sides. If not, nuke it some more. Wish I could be more specific on time, but it’s always a matter of size and microwave power. It’ll be soft and easy to cut like in your recipe. Oh wow! Sounds like some great ideas! I’ve never tried any of those but I may have to!! Thanks!! This looks totally delicious Tieghan! I’m wondering if I could trick my husband Tom into eating spaghetti squash?? Happy Halloween!! AH!! Maybe!! Might just end up loving it!! This would make Halloween absolutely perfect! So hope you got to make it Matt!! 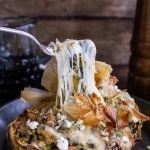 Spaghetti squash is one of my favorites but I have never thought to make it in a crock pot. Good thinking! Hope it works great for you!! I was sold at the sight of that burrata! Yes!! I would have been to!! Our cul de sac had a party last night with a driveway fire pit. It was ” one stop trick or treating ” for area youngsters! I have frozen homemade bolognese sauce in freezer from lasagne I made last week. Going to get a spaghetti squash and have an easy dinner this week! Thanks for the great idea!! Tieghan this looks awesome! Super cozy and yummy, I’ll be trying soon! I also can’t believe it’s November and the holidays and winter are right around the corner!!!! AHHHHH! This crockpot-spaghetti-squash-lasagna is freaking amazing! I cannot wait to try this!!!! Okay, looooove this! The crockpot is such a savior in the fall and winter, and I can’t get over how delicious this looks. AND it’s low carb! Yuuum! Just made and enjoyed this! My 4 year old loves spaghetti squash so this was a nice way to change things up on how to use the squash. So comforting and easy to make! How long would you do this if you were doing it on high? hey Caitlin! At least 5 hours. The squash takes a little time to cook, so probably nothing less than 5 hours. Let me know if you have any questions. Hope you love this! Thanks! Do you cook this on low for 6 hours or for 7 – 8 hours? There are two different cooking times listed. I love this recipe, Teighan! All the comfort of a good carb meal, with none of the guilt :). Sometimes we need to eat guilt free and still be satisfied !! haha! Thanks Laura! When do you add the mozzarella ? Teighan! How many people does this recipe serve? Can’t wait to make it tomorrow! Thanks Rachel!! This will serve 6. Please let me know if you have other questions. Hope this is a hit. Thank you! ? I was super excited about this recipe! And then I made it and the sauce came out watery. Which is probably because I just dumped the tomatoes and the juice they came in together. I’m guessing I should have just added the tomatoes drained? Whole or cut up? Somehow I’ve never cooked with them before so didn’t know. If solo tomatoes you might want to make that clear in the instructions. My squash is also a little watery as well. So nothing quite came out like I thought. Any suggestions? HI Christine! I am so sorry you had trouble with this. Somehow my recipe has been changed in the post. I working to try and fix it now. What size can of tomatoes did you use and how long did you cook for? Again, so sorry for the trouble, but hope I can help make the recipe great for you! Thanks! Thanks for responding! I used a 32 ounce can, undrained. I cooked on low for 7 hours. Awesome!! Hope it was delicious!! Note for best Spaghetti squash do not cut longwise, cut in half on the short side. Makes better “noodles”. Yay!! So happy you all liked it!! Thank you so much!! 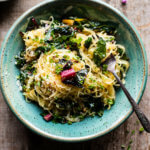 We tried this and after leaving it in the crock pot on low for 6.5 hours the spaghetti squash was totally smushy and did not have a noddle texture at all. It did not look anything like the noddles you have in the picture, any recommendations so that the squash comes out in strands and not mush? How big was your squash? Was it small? that might have been the reason it cooked faster. It also might be that your crockpot cooks things at a higher temp. I would try adding the squash 2 hours into cooking. I think that should keep it cooked, but firm. Let me know if you have questions. Thank you! This is a very bland recipe. I would suggest skipping the hamburger and replacing with sausage. The “sauce” is less of a sauce and more of a meat and tomato mixture. I did try to spice it up with more bay leaves and oregano but it was still bland. I do have to say that it is an excellent way to cook spaghetti squash – turned out perfectly. Sorry you found the sauce bland. 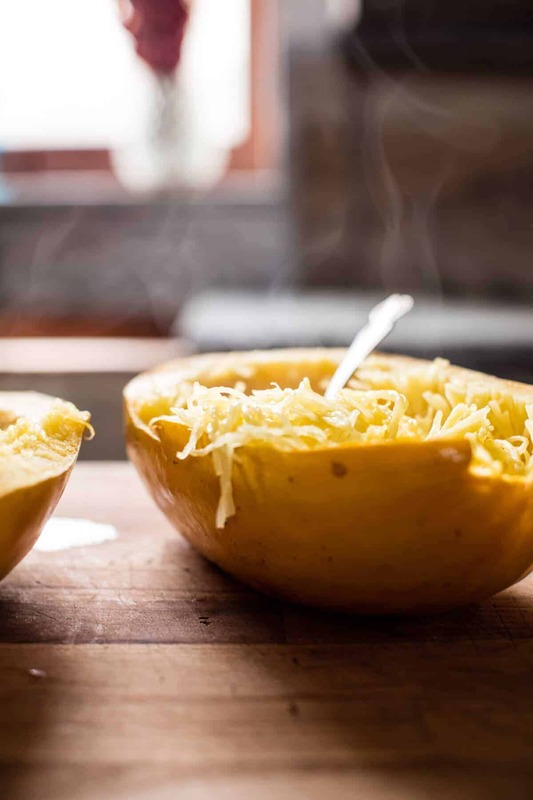 Spaghetti squash is one of my absolute FAVORITE winter squashes! For Halloween, I basically put together the most last-minute costume and just ate tons of vegan donuts, had lots of good time with my friends and so much more! It was the best! Tieghan!! My darling son Evan Bishop says he’s coming over for dinner tonight!! This is the perfect dish and I can’t wait to make it. Also, congrats on your new book, I’ll be buying several for family and friends. Keep up the good work and give hugs to Mom! Hey Patti!! 🙂 That is so awesome and I hope you guys both loved it!! 🙂 Thanks for the kind words. Hope you guys are well back in OH. Tell everyone I said hi! Thanks again!! Oh My Gosh!! This is delicious!! !Perfect dinner with a glass of wine and March Madness!!! thank you Tieghan! Hi Patti! Definitely a perfect one to eat during march madness! What a fantastic idea!! This recipe has my name all over it. I simply love the idea of a delicious meal that can be made while you’re busy doing something else. I love your plates and bowls!! Did your dad make them?? Wish I could have seen you at Halloween. You should definitely try this recipe out, I hope you love it! My dad did not make the plates and bowls, I got them from a shop in London! Thank you Marisa! This recipe was delicious and such a clever, easy way to fix squash. Hi Tieghan — If someone is dairy-free, could I use chicken or vegetable stock instead? Can’t wait to make this! Tried this for the first time this weekend – it was divine! Thank you! I am so happy to hear that! Thanks! Do you drain the can of peeled tomatoes or keep the sauce? I can’t wait to try this. I am just wondering about the meat. The first two ingredients are 1# of beef or sausage so is this 2#s total or did the line just get repeated? I had my dad make this for dinner while I was at work today and it has replaced my mom’s favorite Bolognese. Easy prep & clean up, fun way to cook the squash and the burrata melts to perfection in the sauce making it creamy. That is amazing! I am so glad you loved this recipe and hope you had a great night with your dad! Thank you! I made this tonight and it was a total winner. I think the only recipes I make anymore are yours. This was an easy one to make on a work day and there was plenty of left overs for tomorrows lunch. Thanks for a great, healthy dinner! Love, Love, LOVE this one! The spaghetti squash was cooked perfectly! I’ve never had any luck with my crock pot cooking – so would you suggest to cook on high for 6 hours? I think the options are “warm” “simmer” “medium” “high”??? Whenever I go to serve my crock pot cooking it’s never done! – help! Can I do this in my Instant Pot on the slow cooker setting? Thank you Marina! I hope everyone enjoyed this! 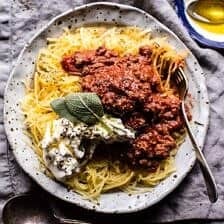 HI if I do not use sausage how much beef should I use for this recipe? HI! 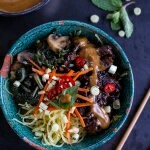 looking to make this for Valentines day, but I do not have a slow cooker, can I simmer in a pan for a certain amount of time? Hi! Could you make this with an Instatn Pot instead of a Crockpot? If so can you please provide cooking instructions?